Are you shopping for a new mid-size sedan that is powerful, fuel-efficient, spacious, and has the safety features to protect your precious cargo? Then you will want to explore the Honda Accord. The Accord consistently ranks as one America's favorite mid-size sedans, and the latest version further improves on everything that drivers of previous Accord models have loved about this sophisticated and well-appointed sedan. Ceilidh Honda proudly serves drivers and families near Antigonish, and New Glasgow. We invite local drivers and beyond to visit our New Glasgow, NS showroom to test drive the stylish new Honda Accord. 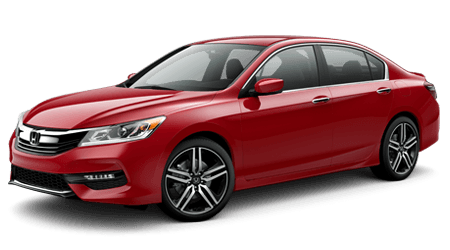 While browsing our website, you can shop our full inventory of Honda Accord sedans in New Glasgow and other new Honda models, get pre-approved for your new car loan, value your trade-in vehicle, and much more. Let's see how the 2017 Honda Accord stacks up against its classic rival, the Toyota Camry. Ask any driver of a mid-size sedan, fuel economy was a significant factor when choosing their vehicle. There is great news on the fuel efficiency front for the 2017 Honda Accord; the Accord's fuel-sipping standard engine will put you miles ahead of Camry drivers, who will have to pull over to more frequently to refuel. The 2017 Accord's standard 2.4-liter i-VTEC inline-4 engine achieves up to an EPA-estimated fuel economy rating of 27 miles per gallon in the city and 36 miles per gallon on the highway. Drivers of the Toyota Camry can expect only to muster 24 mpg in the city and 33 mpg out on the highway. That's right; you read those figures correctly, the 2017 Accord tops the Camry by up to three miles per gallon! With its significantly more fuel-efficient powertrain, it is no wonder that so many drivers are either switching to Accord or passing on the Camry and buying their second or third Accord! Given that the 2017 Honda Accord tops the Toyota Camry in standard fuel economy, you may think it safe to assume that the Camry is the more powerful choice. The reality, though, is quite different. The 2017 Accord once again bests the Camry, with more standard horsepower and torque! The 185-hp, 2.4-liter i-VTEC 4-cylinder engine found beneath the Accord's hood generates 181 lb-ft of torque, which translates to an additional seven horsepower and 11 lb-ft of torque over the new Camry. The Camry's larger, 2.5-liter inline four engine develops just 178 hp and 170 lb-ft of torque. Since these two mid-size sedan rivals have a nearly identical curb weight, the Accord will likely feel more powerful and capable than the Camry in real-world driving conditions. If you seek both fuel efficiency and power in your new mid-size sedan, then skip the Camry and get into a Honda Accord. Come and test drive the performance and efficiency of the 2017 Accord near Antigonish, and New Glasgow at Ceilidh Honda. If you are in the market for a mid-size sedan, often called a 'family sedan,' then chances are you want enough space inside the cabin to seat five passengers comfortably. Even if you are single, or you have a small family, you never know when the Accord's spacious seating for five will come in handy. In the new Accord you will find more front headroom, legroom, hip room, and shoulder room than in the Camry; in other words, the Accord's cabin provides more space for the driver and front passenger in every measurable dimension! When you consider that the driver seat and front passenger seat are the most often used seating spaces in any vehicle, choosing the Accord over the Camry is a no-brainer when you care about passenger space and comfort. Just when you thought the latest edition of this storied mid-size sedan rivalry couldn't get any more lopsided, we come to cargo volume. The 2017 Honda Accord's trunk holds nearly 1/2 cubic foot more cargo than the Camry's, which is significant when you are trying to pack everything inside for your family's long weekend road trip or cross-country adventure. Both of these sedans are available with a convenient 60/40 split-folding rear seat to increase cargo space and the ability to haul bulky items, but with its added space, the Accord's trunk and cabin are simply more versatile than the Camry's. Both the 2017 Accord and new Camry mid-size sedan offer an extensive list of safety features, but the Honda edges out the Toyota in overall safety, including safety ratings. The NHTSA has awarded the Honda Accord with a 5-Star Overall Crash Test Rating, which is the highest overall crash test rating available. Toyota's Camry, meanwhile, received a few 4-star safety ratings, including in overall frontal crash, rollover, and side pole crash. While both of these cars are designed to keep you safe, why not choose the car that passed the NHTSA's crash safety tests with flying colors? Isn't it about time that you take Honda's impressive Accord mid-size sedan out for a test drive to experience it for yourself? If you live near Antigonish, and New Glasgow, then visit Ceilidh Honda. We are confident after a few minutes inside the spacious and well-appointed cabin, and a thrilling test drive, you will have your heart set on driving home a Accord. You can shop our current inventory of new Honda Accords and other Honda vehicles from the comfort of your home, here on our website. While shopping our online inventory, why not value your trade? Our Honda dealership is also home to a dedicated Honda auto service center, staffed with Honda certified service technicians who will keep your vehicle running like new long after your purchase. For all things Honda near New Glasgow, NS, choose Ceilidh Honda!